While most people celebrated New Year’s Eve with friends, Louis Taylor spent his evening becoming a millionaire. The 39-year-old captured the Professional Fighters League middleweight title with a 33-second knockout win over Abus Magomedov. Taylor grew up a Bulls basketball fan living in Chicago and sees similarities to his win and Michael Jordan sinking a game-winning shot during his career. “In your mind as a fighter that’s how you always want your fights to go.” Taylor explained. 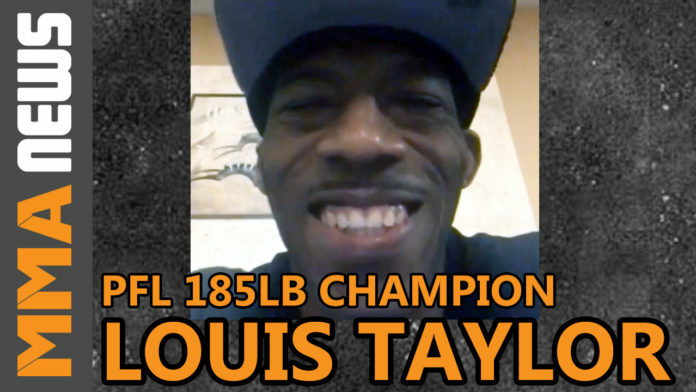 Taylor (18-4-1) emerged as the dark horse this PFL season to take home the middleweight championship. He defeated Anderson Gonçalves, Andre Lobato, Rex Harris and went to a draw with John Howard before winning the tournament. Taylor feels vindicated with the win, however still has critics questioning his Cinderella run in the tournament. The Chicago Fight Team product’s stock has never been higher and while he just competed five times this year, he’s looking to get back in the cage soon. While other organizations may look to snag him up, don’t expect to see him link up with the UFC anytime soon.